Senior Melissa Cerrillos set a new school record in the 3,000-meter steeplechase with 10:54.62, breaking her previous time of 10:55.51, earning her SCIAC Athlete of the Week honors. 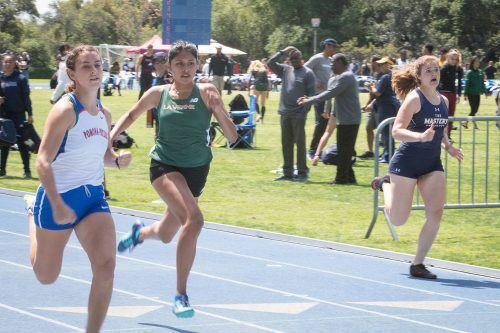 Many of the other Leopards were also looking to achieve new personal bests as they approach the end of their season, with the Southern California Intercollegiate Athletic Conference championships right around the corner. “This past week it was a little bit more intense, and we are focusing on (our) personal bests and getting better each meet,” junior middle-distance runner Mackenzie Bell said. The shift in training resulted in many of the Leopards’ runners placing in the top three in their heats. Sophomore Ashley Garnica took third place in heat four of the women’s 1,500-meter with a 5:09.85, putting her at 56th overall. Junior distance runner Catherina Makinna Posada took first place in heat four and 63rd overall with a 5:13.68. The men’s 4×400-meter relay team finished fifth with a time of 3:22.29. The Leopards are looking to qualify for nationals, which take place May 23-25 at the SPIRE Institute in Geneva, Ohio. Robinson also ran the 200-meter and took 38th place with a time of 22.78. Sophomore Matthew Salas for the Leopards looked to break the current 800-meter record of 1:54.10 after tying it last weekend on La Verne’s home track, but fell just short by coming in at 1:54.20. La Verne is set to return to action at 10 a.m. Saturday for the SCIAC Multi Dual No. 3 meet at Whittier.